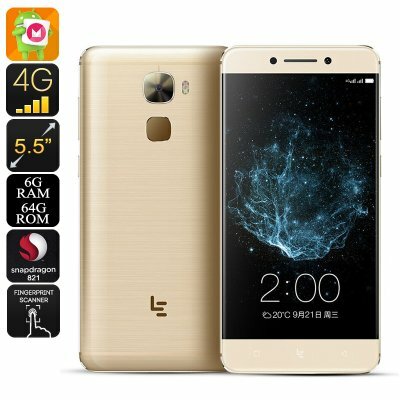 Successfully Added LeEco Le Pro 3 Android Smartphone - Snapdragon 821 CPU, 6GB RAM, 64GB Memory, Android 6.0, 16MP Camera, 4G (Gold) to your Shopping Cart. The LeEco Le Pro 3 brings us all that is best from Chinese flagship phones, with its stunning specs it's an affordable flagship phone for the masses. A Snapdragon 821 processor clocked at 2.35GHz is the nexus of this phone's power and running alongside 6GB of DDR4 RAM ensures you get a lightning-quick performance that ensures the LeEco Le Pro 3 can handle all the latest games and most demanding tasks without a single hiccup. A testament to its prowess are reports that the LeEco Le Pro 3 scored over 150,000 on the AnTuTu benchmark test marking it out as one of the most powerful options available and certainly at the top of its class when the price is considered. With its 5.5 inch full HD screen the LeEco Le Pro 3 brings stunning images with bright colors and super brightness so you won't miss any details. This adds to the immersive experience when using the phone for playing games or watching movies. As you'd expect from a flagship smartphone the LeEco Le Pro 3 has a plush finish with its all metal body, rounded corners, 2.5D arc glass screen and polished finish the phone feels great in the hand and has the premium appearance you'd expect from a leading device. The cameras are a true highlight of this phone, while the 8MP front selife cam is certainly impressive it is overshadowed by a Sony IMX298 16MP rear camera. With an F2.0 aperture, autofocus, and PDAF the camera is sure to deliver stunning shots. A dual color flash ensures a great balance so photos aren't washed out or too dark so you'll get the perfect picture night or day. This neat camera can also record 4K footage at up to 30 FPS so you can record every detail of those memorable moments ensuring they'll last a lifetime. The operating system on this phone is Android with a twist, in the form of LeEco's custom OS. known as the eUI5.8 this Android 6.0 based system brings all the comforts of Android 6.0 but with a more versatile front end featuring a number of enhancements for a better performance and interactions. The LeEco Le Pro 3 Android Smartphone comes with a 12 months warranty, brought to you by the leader in electronic devices as well as wholesale Android Phones..